In this part of the Warre Hive Construction Guide we will assemble the quilt. The quilt rests between the top hive box and the roof. It is the easiest hive component to build…just four pieces of wood and some cloth. 2 short sides measuring 30cm long by 10cm wide (11 13/16″ long by 3 15/16″ wide). The edge width of the board is up to you. A good size is anywhere between 20mm to 25mm (3/4″ to 1″) wide. 2 long quilt sides measuring 34cm long by 10cm wide (13 3/8″ long by 3 15/16″ wide). 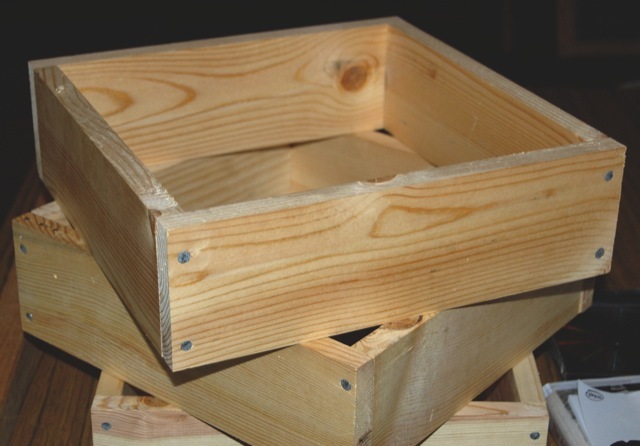 Take the pieces of wood and assemble them into a box. As you can see in the picture below, the longer sides go on the outside of the shorter sides of wood. As you build the box, check the internal measurements every so often. They should be 30cm by 30cm (11 13/16″ by 11 13/16″). 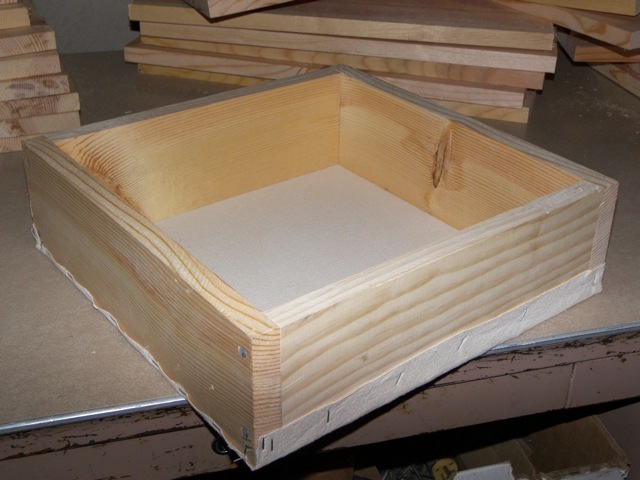 Take the box you built in Step 2 and lay it on a flat surface. Lay the cloth over the box, as in the picture below. Use your staple gun to staple the cloth to the box. You can also use a hammer and small brads. It works best to put a couple of staples in one side to hold the cloth to an edge, and then stretch the cloth to the opposite side and staple it. Do the same for the remaining two sides. Go back around the box stapling every few inches to hold the cloth in place. You want the cloth to be taut across the top of the box with no wrinkles. It will stretch over time, so get it good and tight. Trim any loose ends of the cloth, and fold the extra amount of cloth over the edges and down the sides of the box. Staple or nail the cloth to the sides of the box. This will keep the edges from fraying. You can also fold the cloth around the corners of the box to further prevent fraying. As you can see, I cut my edges long to demonstrate the corner for you. You are welcome to trim your fabric shorter to save on cloth. Congratulations on completing the Warre Hive Quilt! In the next section, we will assemble the Warre Hive Floor. 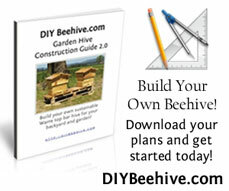 This entry was posted in Warre Hive Construction Guide and tagged beehive plans, diy beehive, emile warre, HowTo, Sustainable Beekeeping, Top Bar Hive. Bookmark the permalink. Nick, what are you using for cloth- just heavy cotton, or canvas? I was considering using jute (gunnysack), but might use it to contain insulating materials, instead. Margie – I am using 100% cotton duck, which is a heavy cotton canvas. You can purchase it around here for about $5 a yard, cut from a 60″ roll. One yard is enough to provide both cloth and quilt bottom for almost three hives. Thanks Nick. The texture made it a little hard to figure out. Pussywillows are just baaarely starting to emerge up here. chad – The quilt provides insulation and heat retention for the bees. It allows condensation and moisture to escape, but retains the important hive environment of nest scent and heat. Thanks for your very informative blog and website. I have one horizontal TBH (I’m a newbee :)) and am enjoying it and the bees. Was curious about employing a quilt in the HTBH, esp. here in Nova Scotia Canada. Your thoughts appreciated. Edward, I would recommend it. Some of us who are still in Langstroth equipment have integrated the quilt box into our hives. Good luck with your apiary! In parts of the tropics, where night time temperatures will never fall below 60F is the quilt still needed, or is this solely for temperate climates that experiences a more severe temperature drop? I currently have a HTBH in UK. I don’t think the quilt is needed if night temps never drop below 60F. I have added a quilts to my frame hives though but I also have open mesh floors on them. If you are using a cloth for the base of the quilt, do you also need a separate top bar cloth? Hi Graham, you’ll find yourself replacing that cloth due to the bees chewing on it, it’s a lot easier to replace a separate piece that you add between the quilt and the hive boxes than rebuilding your quilt with new material. I don’t understand how moisture leaves the hive as there is a “mouse board” on top of the quilt. Are there vents anywhere? There are no vents per se. The “mouse board” (roof) will readily pass humidity while insulating at the same time. It helps with bee scent and minimizes disruption in the hive. Think of your house, you have vents on the roof and a layer of drywall and insulation in the ceiling, if you had open doors and open vents in the ceiling you would have a really hard time regulating the temperature in your home. Just to be sure, the cloth side of it goes down, closest to where the bees are, correct? I have a top bar hive and I’m about to make a split. I also have an old Langstroth (donated) and extra top bars, which fit perfectly in the Langstroth. From what I see, conversion of the Langstroth to a Warre hive should be very simple. Am I missing something? I heard some mention in a video of starch and some kind of bran impregnated cloth. Is that an additional cloth or is that the one traditionally attached to this quilt frame? I went ahead and converted my Langstroth to near as I can figure, and acceptable Warre hive. (Basically a rotting tree trunk. I was about to fill the medium above the box with frames with store-bought straw, and I realized the best thing was the duff from the woods surrounding the hive.